Thanks to its population of 1.3 billion people, it is a simple fact that when traveling in China you should be prepared to face some crowds during your trip, especially when you are visiting popular tourist attractions. However, don’t let that put you off planning a trip to this bustling, fascinating country; with a little forward planning and creative thinking, you can maximize your time in China without waiting in queues or shouldering past crowds of people. 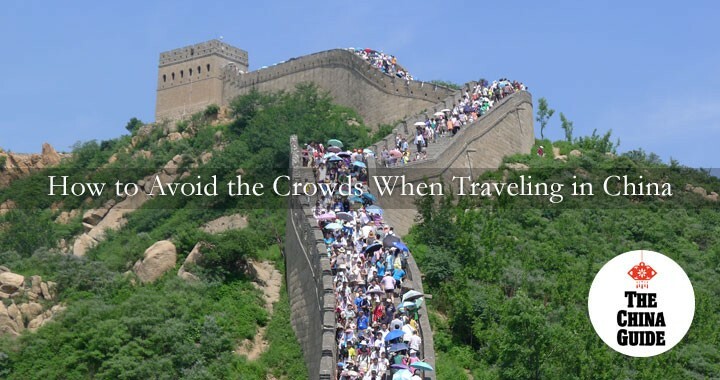 We have put together a comprehensive guide below with tips for how to avoid the crowds when traveling in China. Follow these simple instructions and you may be surprised at how few people you encounter during your trip, even at the most famous tourist sites. When it comes to traveling in China, foreign visitors have an advantage over the locals in that they can plan their visit at any time, while most local Chinese people are restricted to traveling during the few national holiday periods, as most companies offer a relatively limited amount of paid holiday. Labor Day (May 1): International Workers’ Day, also known as May Day, is a one-day statutory public holiday in China, usually extended to a three-day holiday by supplementing the two days nearest to the weekend. Generally good weather means that this is a very popular time to travel in China and many sights (particularly family-friendly activities such as beaches and outdoor amusements) will be crowded. National Day (October 1): If you keep up to date with China news, you might have seen the pictures of crazy queues and packed tourist attractions around the time of the National Day holiday. This week-long holiday (October 1 to 7), the so-called “Golden Week,” is the most popular time to travel in China; more than 700 million trips were taken during Golden Week in 2017. You’ll need to really get off the beaten path if you want to escape the crowds at this time of year. Chinese New Year (January-February): Unlike the other two holidays above, Chinese New Year is more a time to spend with family than to go on vacation. However, since so many people in China move away from their families for work, during the weeks prior to and after Chinese New Year it can feel like every single person in the country is packed into the airports and train stations (in fact, most reports estimate that more than a billion trips are made at this time of year—nearly the entire population of China!). One advantage of this is that major cities like Beijing and Shanghai are actually quite quiet at this time, since everyone has left to go back to their hometown, but on the flip side, many restaurants and small businesses are closed. You may consider getting up early while on vacation to be sacrilege, but the benefits outweigh losing an hour or two of sleep. Most Chinese tour groups don’t head out until after breakfast at around 9am and even most independent travelers start their days a little later. The opening hours of different tourist attractions around China vary according to the season but most will be open by 8am and most parks will be open by 6:30am. This is especially true for old towns that have become famous throughout China, such as Pingyao in Shanxi Province, and Lijiang and Dali in Yunnan Province. In fact, if you want to visit a popular old town/village, we recommend you spend a night in the old town you are visiting and then get up early the next morning to see the town as it wakes up and get a more authentic feel for how life might have been hundreds of years ago. An added benefit of staying overnight is that you get to experience the bustling nightlife in the old town and enjoy the beautiful streets and alleyways when they are lit up. How early is early enough to beat the crowds, you may ask? We recommend getting up before 7am, giving you a couple of tranquil hours before the hoards of people arrive. Another advantage of getting up early is that you may see locals starting their daily routine. Another way to beat the crowds is to choose sights that are not as well-known and haven’t yet been incorporated into the itineraries of most tourists. Less well-known doesn't necessarily mean not worth visiting. In Yunnan, for example, where old towns abound, one option is to visit the old town of Shaxi, about two hours' drive away from the more popular Lijiang Old Town. Shaxi is much smaller than Lijiang and most of the streets and buildings have remained untouched by modernity. Most importantly, there has been very little commercialization. Life goes on in Shaxi much as it has done for hundreds of years, a life that you can get a taste of at the long-established Friday morning market. Similarly, most Chinese people choose to go to Badaling Great Wall because of its established fame as the first section of the Great Wall that opened to the public and its proximity to Beijing. But there are several other sections of the Great Wall close to Beijing that offer even better scenery and have less visitors, such as Mutianyu and Jinshanling Great Wall. During a recent trip to Kunming, one of our staff was unsure about visiting one of the area’s most popular attractions, the Stone Forest (Shilin), because he had heard that it gets really crowded. He decided to go for it anyway and, as expected, the area near the entrance to the park and around the most photogenic stone formations was overcrowded with selfie-taking tour groups. However, once he hiked 20 minutes from the entrance in the opposite direction from the tour groups, he found himself enjoying the scenery in complete solitude. Moral of the story: don’t give up on an attraction just because it’s popular. Extend your exploration beyond the most popular areas, and you’re sure to find a quieter spot. Another example is Badaling Great Wall, one of the most crowded sights in China. However, most visitors only climb a few towers before turning back and leaving. So, even if you are visiting the crowded Badaling Great Wall, you can hike a little farther out to some of the higher towers to leave the crowds behind and enjoy the Great Wall scenery with less people around you. Each attraction has certain peak hours during the day, so it is always wise to research before visiting an attraction and avoid its busiest times when possible. For example, most tour groups visit the Forbidden City in the morning, so if you are flexible with visiting time, it is better to go to the Forbidden City in the afternoon. Most guidebooks recommend visiting China in spring or early fall, and that is undeniably good advice; temperatures are moderate across the country, areas of natural beauty are at their most stunning, and pollution levels are usually low. However, visiting at these times also means that you’ll be joined by hundreds of thousands of other travelers who have taken the same advice. Despite the scorching hot temperatures, summer is also a peak travel season, as many students and families with children will be traveling during the summer break from school. That leaves winter, when those willing to brave the colder temperatures will be rewarded with significantly smaller crowds and unique photo opportunities. Imagine having the chance to get photos of the Forbidden City or the Temple of Heaven covered with snow. The only exception to this rule is the northeastern Chinese city of Harbin, which hosts a popular ice and snow festival, the largest in the world, from December to February. Every winter, thousands of people brave the frigid temperatures (as low as -30℃) to see amazing statues and structures built from blocks of snow and ice. If you need more advice to get the best travel experience in China, get in touch with our travel experts today.